Authority is a 2014 novel by Jeff VanderMeer. It is the second in a series of three books called the Southern Reach Trilogy. In an interview, VanderMeer stated that, "if Annihilation is an expedition into Area X, then Authority is an expedition into the Southern Reach, the agency sending in the expeditions." It was released in May 2014. Authority revolves around the operatives of the Southern Reach agency. The agency is responsible for the investigation into the unexplained phenomena of Area X. The second book takes place in the human inhabited areas unlike the first book, Annihilation, which was set within Area X.
John Rodriguez a.k.a. Control takes over as the new director of the Southern Reach agency. He is a secret operative assigned by the mysterious Central group which oversees the Southern Reach agency. He comes from a family of operatives: his mother and grandfather are prominent and influential members. Control reports to a handler called "the Voice" at the Central over phone calls and e-mail. In his role as director, Control frequently encounters friction with the existing staff to various degrees: in particular, the assistant director Grace Stevenson, who seems to have an emotional attachment to his predecessor. Control methodically sifts through the accumulated data (interviews, photos, videos) and that there were many more missions than have been disclosed to the public. The 11th expedition alone had multiple iterations with slightly different control factors similar to a lab experiment, leading to the formation of an all-female 12th expedition to see how this composition would interact with Area X. This expedition's biologist, the protagonist of the first book, and the psychologist were both part of the 12th expedition, and Control learns that the psychologist was in fact the Director of the Southern Reach (whom he replaced), a fact that she did not reveal to the other members of the expedition. Control interrogates the biologist, who is undergoing debriefing after she mysteriously reappeared in a vacant lot. Slowly, he begins to empathize with her and understand her interest in the area's ecosystem. However, she is uncooperative, insisting that she is not the biologist and requesting that Control refer to her as Ghost Bird, after failing to gain any information about Area X or what happened there, he decides to use unconventional tactics to get her to talk. Control suspects that he is under hypnosis and (correctly) surmises that his handler, "The Voice", is hypnotizing him to steer his investigation. He is able to throw off the effects of hypnosis and work more independently, but this alienates him from Central and he relies on his mother to protect him from retaliation. Central forcibly removes the biologist from the Southern Reach, as they believe Control has developed an emotional attachment to her. After an unsettling interaction with one of the scientists and another discovery at the former Director's house, Control attempts to deal with minutia around the Southern Reach but finds his path to the science division's laboratories blocked by a living wall that should not exist, and as he runs upstairs in terror, a replica of the Director emerges from Area X, bringing with her the border itself. Control cannot convince others to flee and abandons the facility as Area X envelops it. Returning home to pack, he encounters his mother and learns more about what has been happening. Control also realizes the Director's identity as the little girl in a photo found at the lighthouse in Area X. This completely alters his outlook, as it is now clear that the psychologist is somehow deeply interlinked with the anomaly. Elsewhere, the biologist escapes detention. Based on his knowledge of the biologist's background files and his intuition, Control intuits where she would go and follows her to the site of an old field study she had conducted before she came to the Southern Reach, with Central close behind despite his efforts to dodge their agents. Control finally meets the biologist at a remote location where she has unexpectedly created another portal to Area X at the bottom of a pool of water, a gateway that she believes has formed from a "brightness" she carried that has run its course through her. She jumps into the pool, and Control, hearing a voice inside his head urging him to follow her, jumps as well. ^ VanderMeer, Jeff (February 28, 2014). "Jeff VanderMeer's Annihilation". USA Today. Interviewed by Ian Spiegelman. Retrieved June 7, 2018. ^ Bosman, Julie (February 10, 2014). "Impatience has its reward as books are rolled out faster". The New York Times. Retrieved June 7, 2018. ^ "Paperback Trade Fiction". The New York Times. May 25, 2014. Retrieved 24 May 2014. ^ Bean, Matt (May 14, 2014). "Authority". Entertainment Weekly. Retrieved March 19, 2018 – via ew.com. ^ Jemisin, N. K. (May 30, 2014). 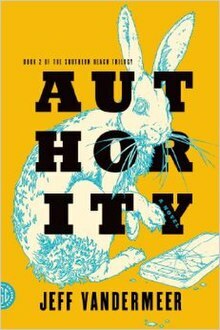 "Science Fiction: Jeff VanderMeer's 'Authority,' and More". The New York Times. Retrieved June 7, 2018. This page was last edited on 20 March 2019, at 06:43 (UTC).